Port Washington, NY, February 26, 2019 – According to the latest Mobile Connectivity Report from NPD Connected Intelligence, 5G awareness has reached nearly 2 out of 3 consumers, totaling 64 percent, at the end of the second half of 2018. This is up from 44 percent at the end of the first half of 2018. Alongside increasing awareness, the report shows purchase potential is strong, as 33 percent of smartphone owners report interest in purchasing a 5G-enabled smartphone once available. Consumers on unlimited data plans, who presumably value the ability to download and stream content as needed, are more eager to purchase a 5G-enabled smartphone, at 43 percent. However, millennials report the highest potential to make the move to 5G with nearly half (49 percent) indicating interest. 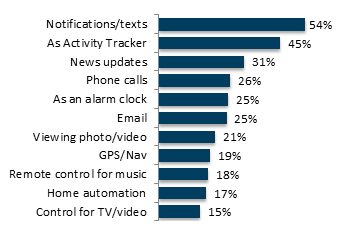 The results of The NPD Group Connected Intelligence Mobile Connectivity Report are based on consumer panel research that reached 3,600 U.S. cellphone users, aged 18+ from diverse regions and demographical backgrounds. This survey was completed in February 2019. Port Washington, NY, December 20, 2018 – Looking to purchase a bigger TV to replace your current model? You are not alone. According to the TV Ownership Trends Report from NPD Connected Intelligence, 40 percent of U.S. consumers who replaced a TV over the last two years were most motivated by a desire to purchase a bigger screen. In fact, 40 percent of replacement TVs1 purchased had a screen size of 50+ inches, with 15 percent of those made up by TV screens 60-inches and larger. In the 12 months ending October 2018, TV sales of 55-inch and larger screens grew 6 percent and represented 63 percent of dollar sales and 32 percent of unit sales. During that timeframe, 75-inch+ TVs saw the largest dollar share gain, now making up 10 percent of dollar sales, according to NPD’s Retail Tracking Service2. When looking at the week of Thanksgiving and Black Friday, sales of 55-inch+ TVs grew to nearly 70 percent of dollar sales and 43 percent unit sales. Driven in part by holiday promotions, 55-inch and 65-inch TVs were the top selling by units, with 65-inch TVs taking the top spot in dollar sales3. 1Replacement TVs are defined as those purchased to replace an existing household TV. 2The NPD Group, U.S. Retail Tracking Service, LCD TVs, Nov. 2017- Oct. 2018. Sales are adjusted for 5wk Jan. 2018 vs. 4wk Jan. 2017. 3The NPD Group, U.S. Weekly Retail Tracking Service, LCD TVs, Week ending November 24, 2018. 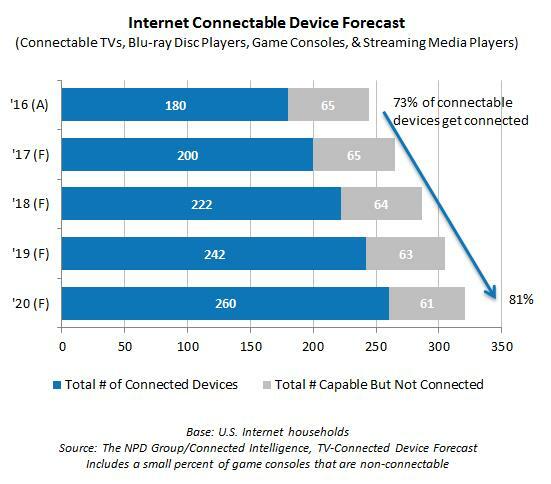 The results of The NPD Group’s Connected Intelligence TV Ownership Trends Report are based on NPD’s quarterly Connected Home survey, which reaches 5,600 U.S. consumers, aged 18+ from diverse regions and demographical backgrounds. They report on more than 12,000 TVs installed within nearly 35,000 household rooms. This survey was completed between July 30, 2018 and August 7, 2018. Port Washington, NY, October 15, 2018 – The role of the consumer device is evolving, as content that was once the domain of the computer continues to migrate to smartphones. While activities such as maps/navigation, email, and social media have been steadily transitioning to smartphones, shopping has seen the greatest two-year increase in smartphone usage. Over the past two years shopping gained six percentage points, with 45 percent of smartphone users now reporting they shop online via their device. 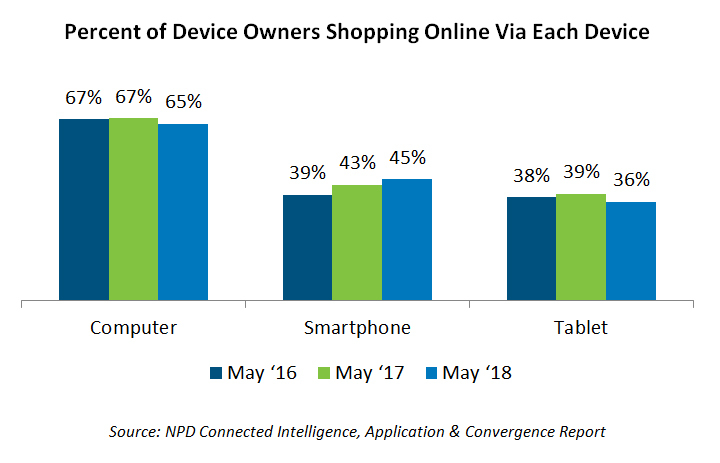 According to the latest NPD Connected Intelligence Application & Convergence report, shopping via a tablet is also beginning to decline, down three percentage points over the past year. In fact, only 36 percent of consumers report using a tablet to shop online. As may be expected, these declines are being driven in part by 18-34-year-old users. While it is clear consumers are increasingly leveraging smartphones for online shopping, computers are still the most commonly used device. Sixty-five percent of respondents indicate they leverage a computer for some online shopping; however, that rate is declining. According to NPD’s Checkout E-commerce data, online consumer technology sales were up 13 percent in the 12 months ending August 2018 versus the year prior, as technology shoppers made nearly one additional consumer electronics (CE) purchase online1. During that time, the percentage of the U.S. adult online buying population that made at least one CE purchase reached 45 percent buyer penetration2, with categories like cell phone accessories, portable audio, and mobile power achieving the highest purchase incidence levels. 2Buyer penetration is the percentage of the U.S. adult online buying population that made at least one technology purchase during the indicated timeframe. The results of the NPD Group Connected Intelligence Application & Convergence Report are based on consumer panel research that reached 5,420 U.S. consumers, aged 18+ from diverse regions and demographical backgrounds. They reported their usage of desktops/laptops, connected TVs, tablets, and smartphones. This survey was fielded from April 26 through May 10, 2018. Trend is compared to the May 2017 and May 2016 surveys, which fielded during a similar period those years. Port Washington, NY, October 8, 2018 – According to the latest Unlocked Phone Demand Report from NPD Connected Intelligence, the unlocked mobile phone market is continuing to expand with an estimated 38 million consumers owning an unlocked smartphone in the U.S., accounting for 15 percent of the market. This is up from 30 million consumers one year prior (end of Q1 2017), as awareness levels reached an all-time high, 74 percent, due to exposure both in-store and online. Despite increasing purchase prices, unlocked smartphone users are still electing to upgrade more quickly than their locked device counterparts. In fact, 56 percent of locked smartphone users hold onto their device for more than two years, compared to 40 percent of unlocked smartphone users. But while unlocked smartphone customers upgrade more quickly, they are slowly extending their device’s overall lifecycle, mirroring what we’ve seen in the locked market. One year ago, 26 percent of unlocked smartphones users upgraded with 12 months, but this dropped to 22 percent in Q1 2018. Port Washington, NY, August 17, 2017 – With the introduction of new devices, new features, and updates to hardware and operating systems alike, 2017 has brought a number of changes to the smartwatch market. As of June 2017, nearly nine percent of U.S. consumers aged 18+ owned a smartwatch, up almost 1.5 percentage points from the six months prior. Additionally, according to latest WEAR Report Industry Overview and Forecast from NPD’s Connected Intelligence, growth in the category will continue, with a nearly 60 percent ownership growth expected from Q2 2017 through Q4 2018, driven in large part by anticipated new product introductions from market leaders. This forecasted growth will result in nearly 15 percent of U.S. consumers aged 18+ owning a smartwatch by 2019. Source: NPD Connected Intelligence/WEAR. June, 2017.